First of all, full disclosure. I know Lord Stanley Fink. I have known him for sixteen years. I know his children too. I know that he donates a third of his income to charity and I know that people who come across him meet an extremely clever, nice, caring man, who worked very hard to be successful. For people who don’t know him, this description is hard to square with someone known as the “Godfather of hedge funds” by the press. His successful period in charge at Man Group saw him grow the firm enormously, and when he retired, he did so with the thanks of investors ringing in his ears for a good reason. He has donated to the Conservative party for a long time, becoming its joint-Treasurer a few years ago for a while. He does so out of deep political beliefs about providing opportunity for people to make the same journey that he did from a little boy in Manchester to the Chief Executive of a FTSE 100 company. However, the two facts I have given makes him a left-wing hate figure. Given the left’s inclination to view people with right-wing views as wicked, and not just wrong, it should be no surprise that Lord Fink’s character has come under attack so often. He said himself, last night, as he faced the TV cameras for a reason I shall come to in a minute, that the attacks on him were a further of example of Labour ‘playing the man not the ball’, something of which they are prone to do. That might have been the end of that. The Guardian, respecting journalistic convention and, importantly, subject to libel laws, wrote about a person, gave them a right to reply, and one could argue the matter was closed. Just look at the wording of that. There is an assumption implicit that Stanley Fink has been avoiding tax. Stanley Fink, of course, noticed this. He felt he had been defamed. But he also knew that Ed Miliband can say what he wants about anyone, as he is protected by Parliamentary privilege. Parliamentary privilege was created to allow members of Parliament to speak freely during ordinary parliamentary proceedings without fear of legal action on grounds of slander, contempt of court or the official secrets act. Parliamentary privilege is controversial because of its potential for abuse; a member can use privilege to make damaging allegations that would ordinarily be discouraged by defamation laws, without first determining whether those allegations have a strong foundation. One wonders whether Ed Miliband did determine whether there was a strong foundation for openly saying that Stanley Fink has been involved in tax avoidance activities. Fink certainly wants to find out. He sent a letter to Miliband yesterday challenging him to repeat the line he used in a Parliament outside the House of Commons. Or, he could withdraw it publicly. It will be interesting to see what Miliband does next. What might also happen here is for the issue of Parliamentary Privilege to be looked at again. It was created before the age of mass media to allow politicians to speak freely when issues needed to be discussed, particularly on points of law. Fair enough. But in this age of mass media, everything said is reported and repeated to a lot of people, and when someone may have been defamed purely to make a political point…well, that is NOT the reason for Parliamentary privilege. I do not know Stanley Fink’s tax arrangement. For all I know, the allegations that he has avoided tax may be true. But I do know that his reputation is very important to him. He is not a man of rapacious greed, and despite all his hard work a reason he donates so much to charity is because he knows more than anyone how lucky he has been to have been so well rewarded financially. 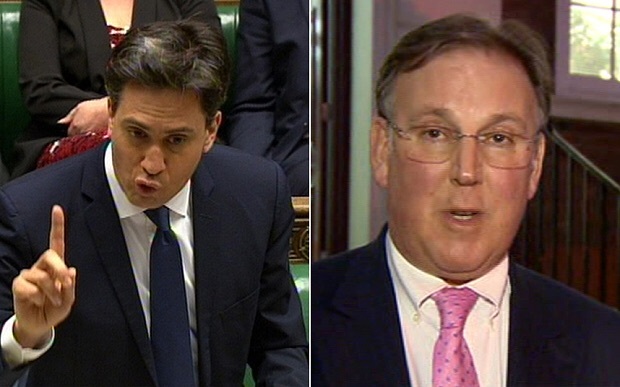 For Ed Miliband, the accusations he made in Parliament were purely political. For Stanley Fink, the damage those allegations will have made will be personal. Ed Miliband has conclusive evidence that Stanley Fink is a Conservative donor who works in hedge funds. Now he needs to provide evidence that he is what he has accused him of being in Parliament. Or admit he was wrong. Reading this it looks like a simple Q, I really think that Lord Fink would be loss if he sought legal action on the basis of Ed asking the same Q outside the house. I believe he knows this, and it takes a lot of putting words in Eds Mouth to make it into a defamatory statement. As to being a lord party donor treasurer etc,this can be equally viewed as exposing the relationship of banking to the Tory party, in the context of the other Banker from HSBC being ennobled and a wallpaper of continued and persistent Tory Q’ing of Union links to Labour over the last couple of decades It is a perfectly legitimate Q to raise. I suspect that given the election in May will be this side of any court case, if Ed repeats outside; proceedings may be started and curtailed soon after the Election. I agree it is a legitimate question to raise. It chimes very well with the political side of this which is Labour constantly pointing out that Conservatives are funded by and therefore legislate in favour of the super-rich. Cameron’s answer at the moment is to point at Labour donors on that HSBC list and that the first person to make Stephen King a Minister was Gordon Brown. That, as we know, was a very different Labour party than we have now, as pointed out by Miliband yesterday – in that he pointed out these people aren’t donating to him now. BUT, that said, Miliband raised the question, but raised it using the wrong example – because he tried to link the mere presence of a Swiss Bank account to tax avoidance for a man who had actually lived there – and I think he should have used someone else.